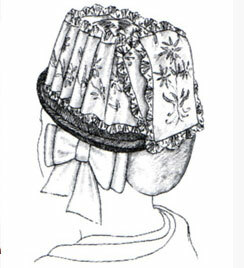 Description of the "Walliser Trachtenhut" (Hat used in traditional dress) with picture – The "Haube" (hood) is made from black satin. 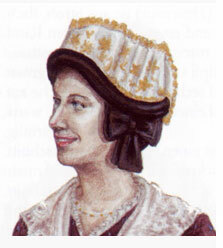 A black point 2cm wide borders the whole "Haube" (hood). Originally the women wore a "Chignon". The "Hut" (hat) is made from straw, 8cm high, the edge is a circle made from black silk or cotton. On both sides a loop falls over the ears. On the "Hut" (hat) an 8 to 9cm high band is attached made from silk, satin or weaved in different colours.